Vexilar’s most popular winter fishing system—the Pro Pack—gets a total makeover for 2006! The new Pro Pack II features an enlarged, super strong handle design. The Pro Pack II is available with either the FL-8se or the FL-18 Flasher/Fish Finders. The new handle also supports the gimbal bracket making it easier to rotate upwards for vertical viewing. The Pro Pack II also comes standard with the T-130 Battery Status Indicator that is pre-rigged. The entire Pro Pack II system is assembled and individually tested. Your new Pro Pack II has additional features like a rod holder, tackle box, and a Vexilar Ice-Ducer transducer. The Pro Pack II case gives you secure, but easy access to your battery terminals and comes standard with a 12 volt, 9 amp-hour battery and charger. The new Pro Pack II design has lots of extras built-in. The new Pro Pack II has been designed to hold all of Vexilar’s after-market accessories for mounting directly on the pack. There is little doubt this feature packed ice fishing system will be a big hit with ice fishermen—and it still fits into a five gallon bucket. 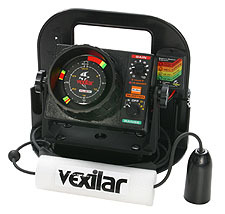 The Vexilar FL-8 SE flasher depth finder / fish finder is the latest in the line of FL-8 series flashers. The SE incorporates a super bright, super fast, display and enhanced interference rejection. With a long history of performance and reliability, the FL-8 series has become the standard flasher for open water and ice fishing with many anglers. The FL-8 SE presents bottom contours, vegetation, structure, fish, and bait fish in a multiple color display. The different colors indicate the strength of the return echo's signal. Strong echoes are displayed as red marks. Weak echoes are shown as green. Medium strength echoes are orange. The multiple color real time display gives you a great advantage over any single color depth finder. Check out these testimonials from fisherman who rely on an FL-8 flasher. A 400-Watt transmitter and an ultra-sensitive receiver back the vivid display. It is easily sensitive enough to show the thermocline and plankton layers. The colors and high sensitivity also make finding changes in bottom content easy. And Ice fishermen know the FL-8 series flashers have become famous for their ability to see small baits at deep depths. Improved Interference Rejection technology lets you fish side by side with almost any flasher or LCD graph with interference free operation. The 10 step IR switch lets you knock out interference between you and another depth finder. FL-8 SE anglers can even fish two depth finders in the same ice shelter or boat. It allows you to have two depth finders close together on a boat or in a fish house without the annoying interference. To order the FL-8SE Pro Pack II, add to cart below or use the order form above.